Genetics is the study and understanding of the phenomena of heredity and variation. A large number of genes are associated with many systemic conditions. Periodontitis is inflammatory condition of periodontium. Periodontium consists of gingiva, periodontal ligament, cementum, and alveolar bone. It is considered being a multifactorial disease. Studies of animals and humans support the concept that a large number of genes' factor may be associated with periodontitis and clearly play a role in the predisposition and progression of periodontal diseases. It has been proven that genetic factors impair inflammatory and immune responses during periodontal diseases. Research on identifying specific genes causing periodontitis may improve and prevent the disease progression. The aim of this article is to focus on genetic risk factors and its influence for the various forms of periodontal disease. Dentistry is a profession dedicated to promote health and wellness of the people. Green dentistry is a relatively new emerging concept in dentistry. Most dental offices are privately-owned small businesses and have no financial advantage to invest in many environmental-friendly practices. For this reason, more research is needed to find cost-effective environmental alternatives in dentistry. 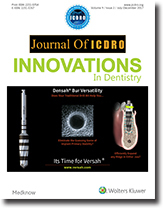 The aim of this article is to expand awareness and practice of eco-friendly dentistry. Purpose: Areca nut, a suspected human carcinogen, is responsible for oral submucous fibrosis (OSMF). Micro colposcopy, a noninvasive technique, can be used for early detection of dysplastic changes in the oral tissues. The aim of this study was to evaluate and compare the effect of areca nut on oral mucosa in healthy controls and those with OSMF using a colposcope. Materials and Methods: The study was conducted on participants with a habit of chewing areca nut and suffering from OSMF. 2% acetic acid was applied on the parts of the gingiva and oral mucosa kept for 2 min and viewed under the colposcope. After a few minutes, Lugol's iodine solution was applied and reviewed under the colposcope. Results: All clinical parameters were higher in Group III (areca nut chewers with OSMF) and Group II (areca nut chewers without OSMF) as compared to Group I (healthy controls) (P < 0.05). Conclusion: Colposcope could aid in the visualization of the changes developed in oral mucosa as an effect in the vasculature of the gingiva. Introduction: Premaxilla or the anterior maxilla is one of the most important sites for different surgical procedures, and any variations in the normal anatomic features can lead to misdiagnosis and altered treatment planning for a clinician. Hence, it is very necessary for the early detection and evaluation of the anatomical variations associated with anterior maxillary region, and the procedure becomes easy with the incorporation of the specific radiologic appliances such as cone beam computed tomography (CBCT). 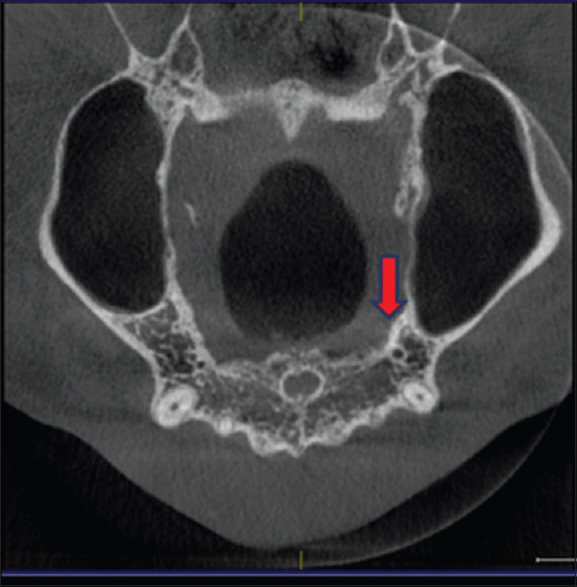 Materials and Methods: One hundred CBCT scans were collected retrospectively for examination of additional foramina and canals in the anterior palatal region, through CBCT images, describing location, and diameter. Results: The mean canal diameter was 1.4 mm, out of the 100 scans evaluated 11 scans were found in which additional foramina were detected and 9 scans wherein canalis sinosus was detected. The mean canal diameter was 1.4. Conclusion: Although there are variations in each patient, with the knowledge of the anatomic landmarks and with the use of advanced imaging techniques, the chances of error in diagnosis and treatment planning can be greatly reduced. Background: Mineral insufficiencies may have far-reaching consequences both systemically and orally. The exact associations and roles of many of the elements are not unequivocally examined till now as far as chronic periodontitis (CP) is concerned. Aim: The present study was designed to evaluate and compare the serum levels of magnesium and zinc in CP cases as compared to healthy controls. Settings and Design: This study was conducted in the Department of Periodontology in MIDSR Dental College and Hospital, Latur. It was a cross-sectional study. Materials and Methods: This study included 60 individuals, 30 in each group, i.e. Group I –healthy controls and Group II – Generalized CP. 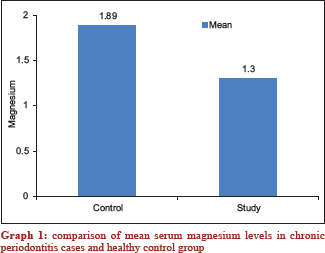 Serum magnesium and serum zinc levels were analyzed using reagent kits. Statistical Analysis: The results obtained were analyzed by applying unpaired Student's t test. Results: Serum levels of magnesium and zinc were 1.30 + 0.78 mEq/L and 62.10 + 18.76 ug/dl, respectively, in CP cases and 1.89 + 0.48 mEq/L and 92.51 + 15.64 ug/dl, respectively, in healthy controls. Conclusion: The mean serum levels of magnesium and zinc were significantly altered in CP cases as compared to healthy controls. Pleomorphic adenoma, also known as the benign mixed tumor is the most common tumor of salivary gland origin, accounting for about 60% of all salivary tumors. Up to 80% of tumors which occur in the parotid gland only, 10% in the submandibular glands, and the rest in the minor salivary glands. The pleomorphic adenoma comprises of the majority of both major and minor salivary gland tumors accounting for 3%–10% of neoplasms of head and neck region. The most common sites of pleomorphic adenoma of the minor salivary glands are the palate, followed by lips and then cheeks. These minor salivary gland pleomorphic adenomas require diagnosis based on clinical features and incisional biopsy should be avoided. These are managed by wide surgical excision. The recurrence of this tumor is a well-known factor, and inadequate initial surgical procedure is the most common cause of recurrence. Carcinoma arising from pleomorphic adenoma accounts for about 3% of salivary tumors. We are reporting a case of pleomorphic adenoma of minor salivary glands around the upper right buccal vestibule in a 36-year-old female. In today's busy world, most patients do not have time for long, drawn-out dental treatment. The time span between extraction and healing after loss of tooth in the anterior esthetic zone can be esthetically and psychologically devastating on the part of the patient. Especially, when a maxillary anterior tooth must be extracted and replaced, immediate tooth replacement with an ovate pontic on a provisional bridge is a good alternative. Ovate pontic helps in preservation of the interdental papilla, which in turn preserves the natural gingival contour that would have otherwise been lost after extraction. An immediate tooth replacement using ovate pontic not only eliminates the psychologically disturbing partially edentulous phase but also results in a much more esthetically pleasing replacement of tooth that is both hygienic and natural in appearance. Another added advantage of the use of ovate pontic is that it rules out the dissatisfaction resulting from an unesthetic ridge lap pontic placed directly over edentulous ridge. Just like the long-lived bird “Phoenix,” arising out of its own ashes, the ovate pontic creates an illusion that the pontic is emerging from the gingiva, even after tooth loss. 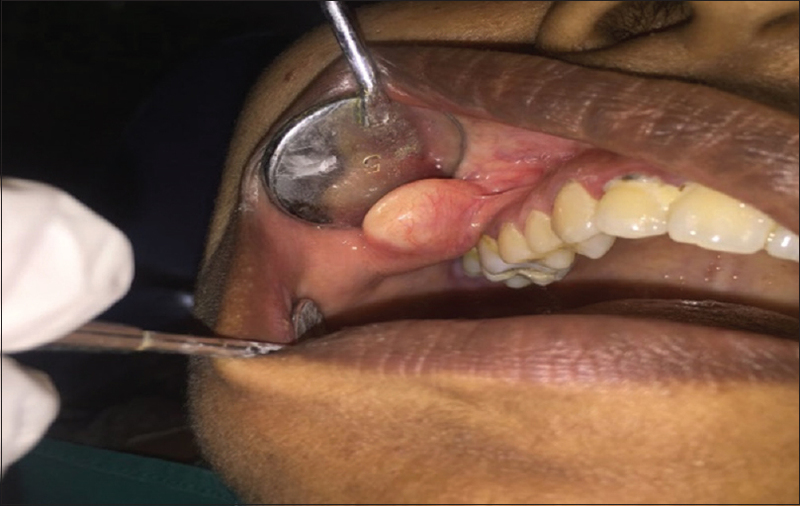 This case report discusses how an integrated approach of fabricating heat cure provisional bridge with ovate pontics before extractions, benefitted a young patient in whom fractured anterior teeth were proposed for extraction. Regenerative endodontic procedures provide new hope of converting nonvital tooth into vital once again. These potential regenerative approaches include root canal revascularization, postnatal stem-cell therapy, pulp implant, scaffold implant, three-dimensional cell printing, injectable scaffolds, and gene therapy. In this article, we describe successful revascularization treatment of necrotic permanent premolar tooth. 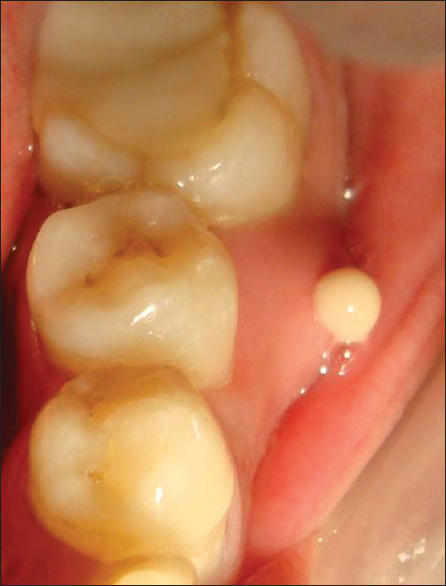 Clinical and radiographic examination showed pulp involvement due to deep pit defect and periapical infection. Examination findings suggested revascularization treatment which was started with irrigation of canals using 1.25% of sodium hypochlorite and saline, followed by placement of 3-week dressing of triple antibiotic paste (ciprofloxacin, metronidazole, and minocycline). After removal of triple antibiotic paste blood clot was induced and mineral trioxide aggregate was placed on the blood clot followed by sealing the canal with glass ionomer cement. During radiographic and clinical follow-ups, the patient was asymptomatic and periapical lesion was healed, roots continued to develop, and root apex maturogenesis was complete. Missing tooth due to congenital absence or traumatic dental injury can cause functional and sociopsychological consequences in the younger population. The treatment modality chosen can impact their well-being during their formative years. 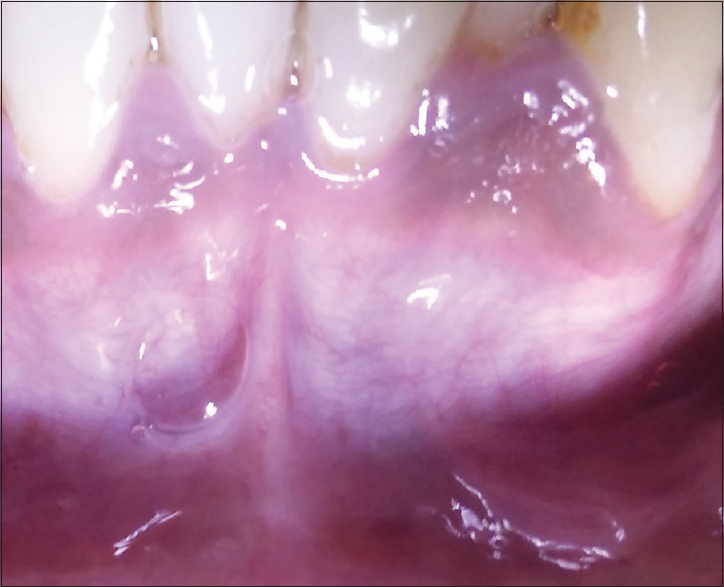 Regardless of the high success rate in adults, implant placement in young patients is not common due to its ankylosed nature and concerns with possible later occurring infraocclusion. 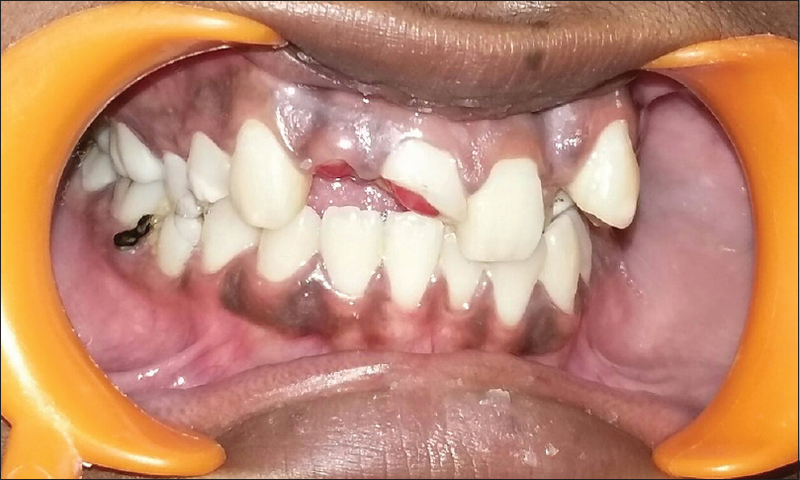 This case report addresses management of a missing anterior tooth by conventional orthodontic treatment along with implant placement and prosthesis, acknowledging the fundamental considerations by a team approach. Oral squamous cell carcinoma (OSCC) is the most common epithelial malignancy affecting the oral cavity. The most common sites for the development are lateral surface of tongue and floor of mouth; the least common sites are soft palate, gingiva, and buccal mucosa. 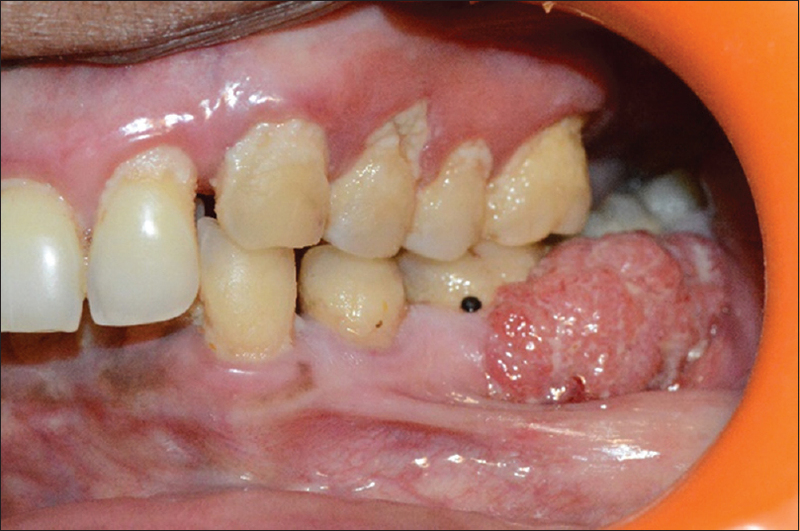 Gingival squamous cell carcinoma can mimic a multitude of oral lesions and enlargements, especially those of inflammatory origin. In addition, predisposing and presenting factors are different from those of other OSCCs. Careful examination as well as routine biopsy are crucial for accurate diagnosis.